War comes to the murky wetlands that surround the Hidden City. 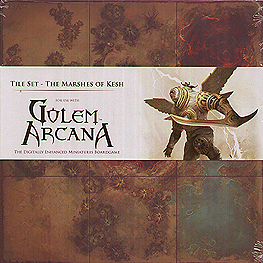 This package includes 6 double-sided terrain tiles for Golem Arcana, featuring a new terrain type - marsh. Up to two sets of these tiles can be combined with other Golem Arcana terrain tiles to add variety to the game or expand the size of the battlefield.